It is usually quiet in my husband’s office between Christmas and New Years, so this year he and I decided to book a river cruise that included Paris and Normandy during that time. We made the reservations before the tragic events in Paris in November, and I have to admit feeling a little apprehensive. However, I would never miss a visit to France. 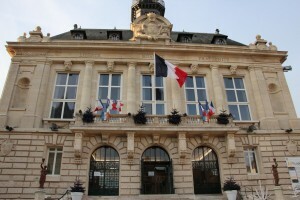 Our first stop in Normandy was a small town on the Seine called Vernon. We disembarked on a chilly but clear December morning. 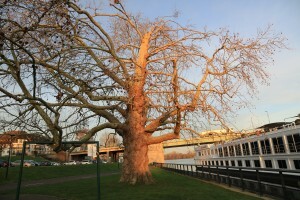 On the river bank next to our boat was a beautiful leafless old tree and a large stone marker. Looking toward the town, we saw the spire of a church and a mixture of old and new buildings. As we waited for our small group to assemble, we read the plaque on the marker that showed a picture of General Montgomery in September 1944 as he rode his open car over the temporary bridge the Allies built to enter Vernon after the Normandy invasion. The plaque indicated that the tree we saw was used to help anchor the temporary bridge. We walked through the old part of town and entered the beautiful old city hall. And then, she walked away. I took her thanks to be for American involvement in the Normandy invasion in 1944. Tears came to my eyes and my heart swelled with pride and appreciation: pride that my country had been part of such a massive and important effort and that my father had fought in that war; appreciation that I had such a moving experience. As I told my husband what had just happened, my voice broke with emotion. But, that was not to be all. 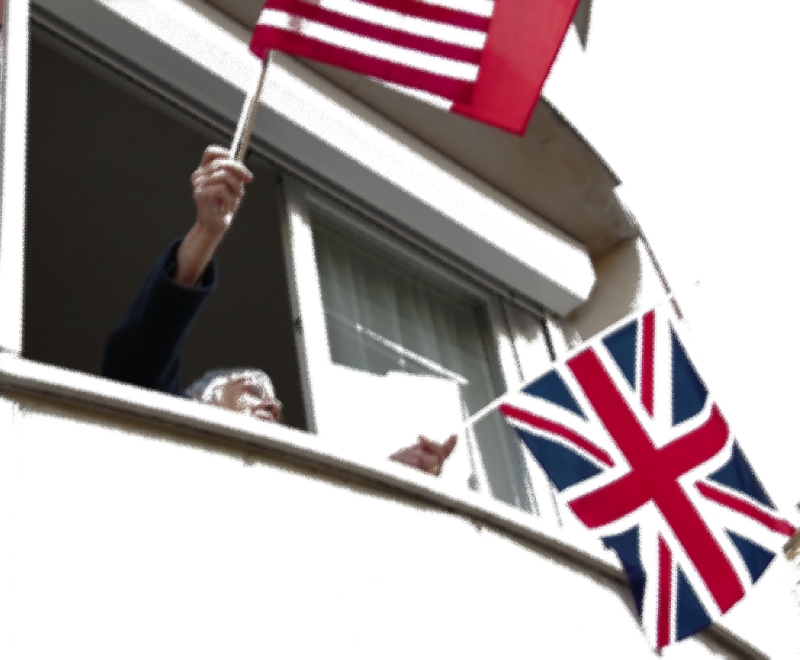 A few minutes later, as we continued our walk around the town, we came upon the same woman leaning out of a second-story window enthusiastically waving three small flags: British, Canadian and American. Again, my heart swelled with appreciation to her and to the brave men and women (French, English, American and Canadian) who had fought, sought cover and often died on these same cobblestones many years before. After the woman appeared at the window, our local tour guide said she had never seen that happen before. She then related her own story about how her family and others in the town sheltered in caves across the river before and during the liberation. She told us that her older brother had eaten lots of chocolate given to him by American soldiers. He apparently was not sleeping and her mother took him to a doctor to determine the cause. The doctor suggested it may have been excess caffeine from all the chocolate. I believe that lovely French woman was acting out of a personal need to say “Thank You ” and maybe a desire to connect in a very limited way. However, her actions affected me and the small number of people in our group who saw her at the window and/or heard her words of thanks. I later spoke to a woman who said this was a highlight of her trip. I had to agree. As I reflect on that brief encounter—less than three minutes in a wonderful 12-day vacation—I see the importance of small gestures and heartfelt appreciation. I recognize that we can affect other people in a very profound way. 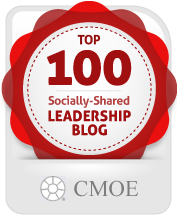 I also think about the impact actions have on current and future generations. 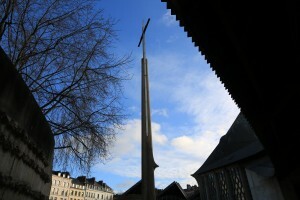 In Rouen, I saw the very modern church built at the site where Joan d’Arc, a patron saint of France, was burned at the stake. In Montmartre, I saw a plaque dedicated to the architect who designed an interesting and beautiful church there. In Paris, I saw Impressionist paintings in the Orsay and Orangerie Museums. 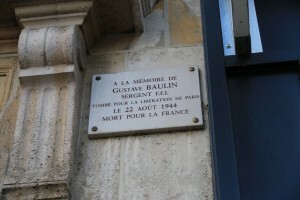 I saw plaques recognizing individuals who gave their lives during the war and then the Liberation of Paris in August 1944. Those ordinary people made an extraordinary difference. They changed the future. And, they inspire me. In light of this, I wonder what impact my own actions have for now and in the future.